In large bowl, break up cookie dough. Using hands, stir or knead in 4 oz chocolate and the flour until well blended. Divide dough in half; cover and refrigerate one half until ready to use. Shape remaining half into 18 balls. Place coconut in shallow dish; dip half of each ball in coconut to coat. On ungreased large cookie sheet, place balls coconut sides up 1 inch apart. Repeat with remaining half of dough. Bake 7 to 9 minutes or until edges are set and centers are almost set. Immediately make indentation in center of each cookie with end of wooden spoon. Fill each indentation with 1/2 teaspoon frosting. Cool 2 minutes on cookie sheet; remove from cookie sheet to cooling rack. Cool until set, about 30 minutes. 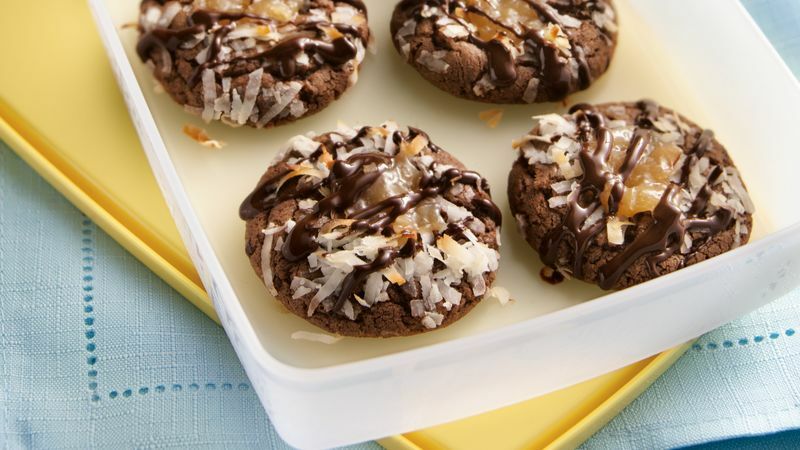 In small microwavable bowl, microwave 2 oz chocolate and the oil uncovered on High about 1 minute 30 seconds or until chocolate can be stirred completely melted; drizzle over cookies. Store in single layer in covered container. Hazelnut spread with cocoa (from 13-oz jar) can be substituted for the frosting.